The weather here lately has really sucked. It’s been freezing cold, rainy, misty, or unseasonably warm and sweaty. Gah. If it’s going to be weather like this, it should at least snow or look pretty. Nope. Just plain bleh weather. I confess I actually went out and bought a heated blanket so I could sit under it at home and pretend it’s summer on the cold days. Needless to say, I’m calling this soup weather. Not just any soup, but spicy soup to warm me from the inside while the blanket warms me from the outside. 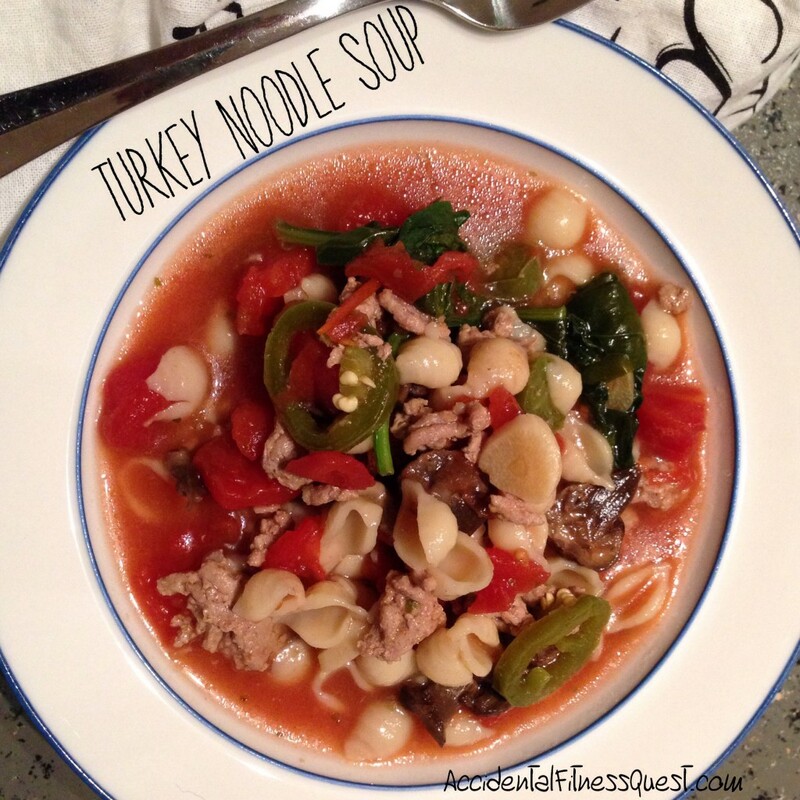 I threw together this soup really quickly with a bunch of random ingredients in my fridge and pantry. Hence the random measurements of some things. I had leftover mushrooms from breakfast the other day. Used those since they sounded good for soup. I bought a bunch of jalapeno peppers since they were on sale so I used one of those. I used another on a burger, one in tacos, and another in eggs. This is definitely a use what you’ve got soup so play with it and have fun. If you’re using the jalapeno pepper, slice it into rounds. I left the seeds in, but to lower the heat you can remove the seeds or leave the pepper out altogether. Heat a large pot over medium heat and add the pepper and turkey. Brown the turkey and break it into chunks until it is cooked thoroughly. Add the oregano, mushrooms and garlic and cook about 2 minutes just to warm everything up. Add the broth and tomatoes with their juices. Bring to a boil. Add the pasta and cook for about 7 – 8 minutes until the pasta is cooked. Stir in the spinach and cook until wilted. Remove from heat and serve in bowls with crusty bread or tortilla chips. Makes 4 servings at approximately 218 calories – 21g protein, 20g carbs, and 6g fat. I got sucked in with garlic bulbs being on sale so I got a steal of a deal on whole bulbs. I roasted all of the heads and used 5 roasted garlic cloves in this recipe for a different flavor. You can use regular cloves or jarred minced garlic. I used teeny tiny pasta shells since I found a bag sitting in the pantry. You can use any tiny pasta shape like alphabets or orzo. You can also use normal sized pasta like penne or bowties, but you’ll have to let it simmer longer to cook the pasta. The leftovers saved really well and the jalapeno flavored nicely the next day. I had it with french bread spread with the roasted cloves of garlic. So good, so easy, and thankfully so warm. Ahhhhh.